We are all a bit time poor and constantly in need of something “on the go”. Just because you don’t have time to sit down and eat between meetings doesn’t mean you need to sacrifice flavour and deliciousness! 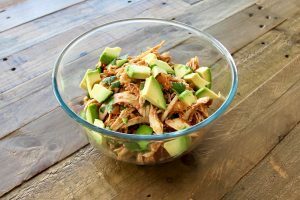 This Chicken Avocado Salad recipe will take less than 15 minutes to make & is a good mix of carbohydrate, fats and protein! If you find yourself a bit high on fats for the day, reduce the avocado to 1 small or 1/2 a large avocado to mitigate the fat numbers. 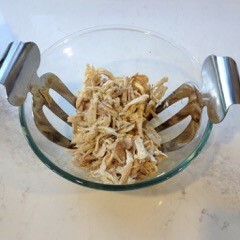 Shred your chicken up & really go crazy – get every last bit that you can find! If you are using a free range chicken (which I hope you are!) 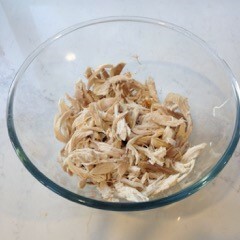 then pop the bones into a freezer bag & store for when you make bone broth. If you want to learn how to make your own chicken in the oven, follow this recipe. 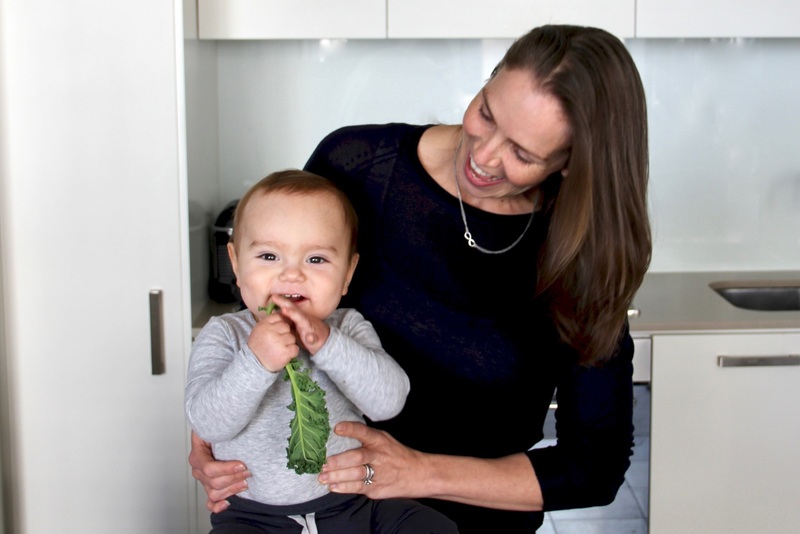 Take it a step further and make nourishing bone broth by following this recipe. Toss your chicken with the olive oil to coat. Add salt and pepper to mix. 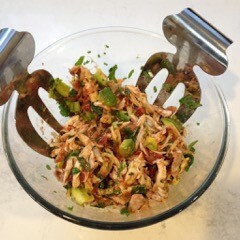 I use “salad hands” like I have pictured here but 2 forks will get the job done, too! 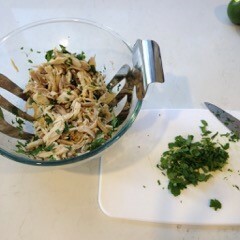 Chop your coriander & mix. There is no right amount here – add as much as you’d like for taste. I’ve put 1/4 cup in the ingredients but this is just a guide. I like to drain my salsa first. This is a personal preference so this step is not necessary. 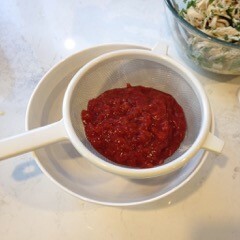 I find some salsa to be a bit more watery than others and if there is too much liquid then your salad will be mushy. 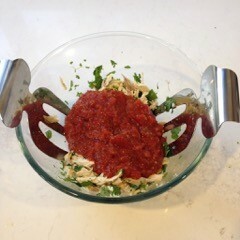 Once drained, mix the salsa into the salad. You can see here that I used the entire jar of salsa – 1 cup is never enough for me and I don’t like having a little bit of salsa lying around so I tend to use the whole jar. 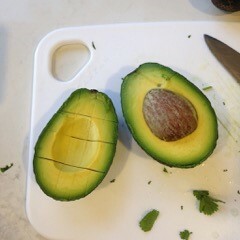 Slice & dice your avocado so you can easily scoop out cubes with a spoon. 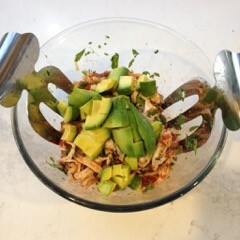 Gently mix through as the avocado can be quite messy if you go crazy on it. Do a final mix, cover & refrigerate. I find this salad tastes best cold. It might be a good idea to split it up into containers immediately because once you start eating it, it’s very difficult to stop! 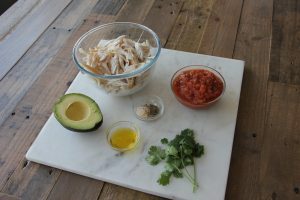 To reduce the fat content, use 1 small avocado or 1/2 a large avocado.